Welcome to Gimson Robotics. 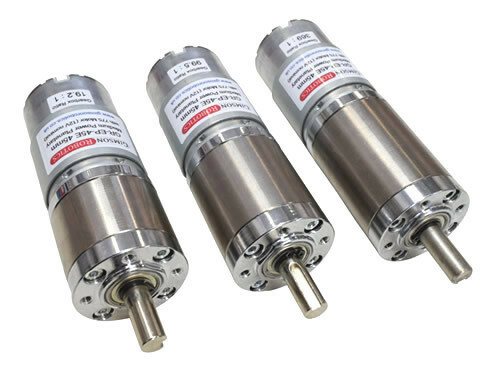 On this website you will find a range of linear actuators, control electronics and DC motors available to buy online at competitive prices. We also offer custom design and development services, including bespoke wiring, product prototyping, CAD design and many more. Please contact us for more information or if you have any questions. Click on a category link above or a featured item below to start browsing. All items are ex-stock and available for delivery worldwide unless otherwise indicated. A clever design that fits a large extension inside a small body. Operating from 24V DC, compatible with Gimson Robotics control accessories. If you are looking for new ways to automate devices in your home or business, for example opening or closing a window both remotely and automatically (via a temperature sensor), or opening and closing a garage door with a tap on your smartphone, then look no further than the GR-Connect Wi-Fi controller. We're very proud of this new product which offers many more control possibilities than the typical RF remote controller, and crucially it allows for software updates over-the-air so improvements are possible without needing any changes to the hardware. More videos will be released to highlight the device features in early January. If you have any questions about the product then please get in touch. We are aware that there is a scammer who has recently been faking cheques using our company name. For the avoidance of doubt we DO NOT use cheques as a company (sending or receiving) and any cheques claiming to be from us are fraudulent! We have made a report with ActionFraud, however if you have any details that may help (for example pictures of faked cheques and/or details of bank accounts the scammer wishes you to send funds to) then please do contact us so we can put as much information together as possible to report to the Police. 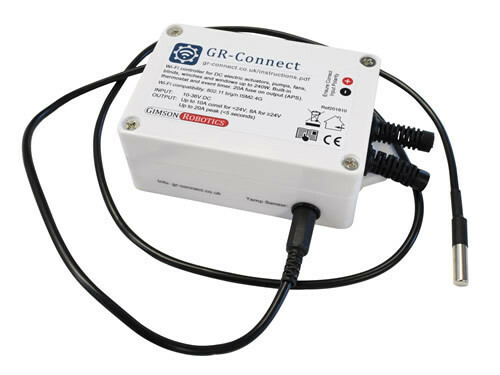 It has taken some 18 months of on-and-off development to reveal the GR-Connect, our first internet-connected product which is designed to control DC linear actuators and electric motors. We will begin sending the first controllers out from the 21st of November, until then you can save on the usual retail price by pre-ordering (only available to UK addresses). Please take a look at the product page for more information. 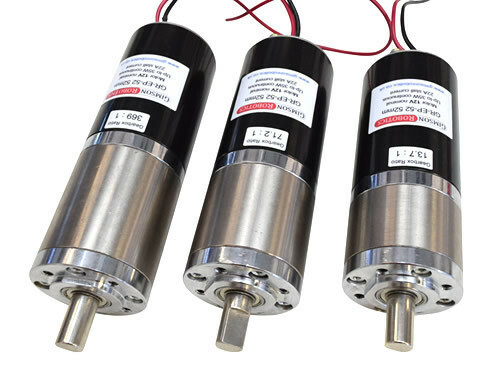 We have recently added two brand new models of gearmotor to the website, the 45mm diameter GR-EP-45E and the 52mm diameter GR-EP-52. There are a total of nine different motor and gearbox permutations over the two models, providing many different power, torque and speed outputs, take a look to see if there's an option to suit your project. As always, if you have a project requiring a custom motor and gearbox combination do get in touch and we can let you know what's possible. We have recently launched a brand new version of our 'GLA-CU' remote control system. The GLA-CU-X3 offers increased security, expanded memory, and an in-built fuse. It also has 23% lower power consumption than the previous version. Unfortunately the security protocol changes mean that older remotes will not work with the new receivers, but if you have an X2 receiver and are looking to buy additional remotes you are in luck; X2-suitable hand-held, chrome fob and standard fob remotes are all at their lowest ever prices. UPS prices for UK Express AM (next-day morning delivery) and for international delivery in Western Europe have been reduced. We will continue to look at reducing delivery costs where possible. A Wi-Fi connected actuator controller is still in the works (over 18 months of development on this now! ), we're finally at the production stage with instructions and other documentation being written as I type. Watch this space for more information. Time flies! We're nearly upon the Christmas break and the end of 2017. We will be on holiday between the 22nd of December and 2nd of January inclusive this year. If you need your order sending before the break please make sure it is placed by 8am (UK time) on Thursday December the 21st, also if delivery is required before Christmas please make sure the order is placed with a guaranteed express method selected (either Special Delivery 1pm or UPS AM for UK deliveries). The website has been recently updated with the 2017 version of the GR-WM1 right-angle gearmotor which features a larger 10mm diameter output shaft. Also added is the current version of 24V 5A power supplies which we have in stock. We also finally have more stock available of 12V 6000mA size power supplies, available to buy online. More items will be added soon. ‣ Royal Mail 1st Class and 2nd Class delivery services have now reduced in price. We now have access to the full Royal Mail 24 and 48 business services which means that we can pass some of the savings onto you. ‣ A new 500mm stroke size of the GLA4000-S Linear Actuator is now in stock and available to buy online. ‣ We now stock a high power motor controller suitable for loads of up to 30A, complete with an LCD display. ‣ Development of a smartphone app-controlled actuator & DC motor controller has been in full swing, we are now aiming for launch in mid December. Contact us for more details in advance of launch. Two new products will be posted on the website in the coming week, watch this space! Please be aware that we will be on holiday between the 10th to 15th of August inclusive, during this time orders on the website will still be accepted but will not be processed until our return on the 16th of August. If your order is urgent then please try to place it by the 8th of August to ensure it is dispatched before we leave. We have been hard at work adding new products to the website over the last few weeks, we're especially pleased to introduce the GLA1500-N model of linear actuator which offers a unique combination of low-noise operation from a compact body while still being capable of generating up to 1500N force, ideal for many home automation projects. Also added in recent weeks have been a larger PWM speed controller, with reversing functionality built-in, while our GLA-CU-X2 remote control unit has been updated with new stylish chrome key fob remotes. This very evening we have been going through our delivery database, lowering prices for many UPS and Hermes options, as well as adding ParcelForce Euro Priority as a delivery option for several western European countries. If you think we should add any other couriers or service options to the website please get in touch with your suggestions. The East Bank Holiday is nearly upon us, we will be closed between Friday the 14th and Monday the 17th of April inclusive, though the website will still be taking orders over this period which will be processed upon our return. We have been incredibly busy over the last couple of months, developing several customer projects as well as new actuator and controller products which we hope to be revealing soon, watch this space! We will be closed between the 23rd of December and the 3rd of January for our Christmas and New Year break. During this period orders will still be accepted through the website but they may not be processed until the 3rd (there is a possibility that some may be processed on the 28th and 29th of December, but please do not rely on this). If you require delivery before Christmas please ensure you select an appropriate delivery method and get your order placed in time for dispatch before the 22nd; if you are unsure about which delivery methods are suitable for you then please contact us. Some new products added to the website in the last month have included a DC motor/actuator PWM speed controller, a 24V to 12V 20A DC-DC converter, and a 24V 5A power supply (mains AC to DC adapter). As always if you have any product queries please get in touch. We have been busy working with tomdallimore.com to make a number of improvements to the website over the past few weeks. You can now search for a country name to find delivery methods, access delivery service information alongside the pricing (on basket and checkout pages), and also pay for your order faster than ever before with a secure card interface built into the checkout (allowing you to bypass the sometimes labyrinthine PayPal payment process). We will continue to make improvements to the website functionality alongside adding new products in the coming days. Prices for next-day (after dispatch) UPS delivery have recently fallen, making it significantly cheaper to send bulky items within the UK just in time for the Christmas posting season. As always if you have any product or website questions please do let us know. We have been busy making many small changes to the website over the past couple of weeks. There are now two new delivery methods available, Royal Mail 2nd Class Recorded in the UK and Hermes International Economy to a range of European countries. Both services offer a cheaper way to send parcels of a range of different sizes. New products recently added to the website include the GR-RK1 modular linear actuator, a 'Make to Extend' relay harness, and DC plug to screw terminal connectors. We are also pleased to announce price drops for both the GLA-CU-X2 receiver unit, and 12V 20A power supply. The website has recently had an upgrade allowing for the the calculation of VAT rates based upon billing/shipping country. If you are ordering to a non-EU country VAT will be automatically removed from your order once you have selected your shipping country. If you are ordering on behalf of a VAT registered business in the EU you will now be offered the ability to enter your registration number at the checkout to remove VAT from your order. We have added a number of new products, with more coming very soon. Please take a look in the Electrical and Actuator Accessories categories for the new items. We are back to normal service after a very busy period over the last week, online orders should take no more than one working day to process, with many smaller orders being sent the same day they are received. 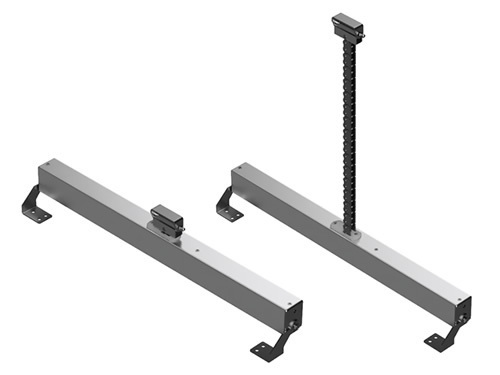 On the horizon we have two new products, firstly an 8mm bracket perfect for use with the GLA1000 model of actuator, and secondly a brand new type of fully-adjustable linear actuator based around a rack-and-pinion drive mechanism. Watch this space for more information! Welcome to the brand new website for Gimson Robotics. The website has been two years in the making, working in conjunction with the talented tomdallimore.com to produce a product database and order processing framework tailored to our needs. You should find the site easier to navigate, especially on mobile devices, and that it has a richer image-focused display approach. We will continue to make changes and improvements to the site in the coming weeks, including the addition of some original new products, watch this space!